"Gray Hair, Black Belt", by Mr. Carl "Cal" Tuohey, describes one elderly-ish person´s experience during a series of Tae Kwon Do classes. 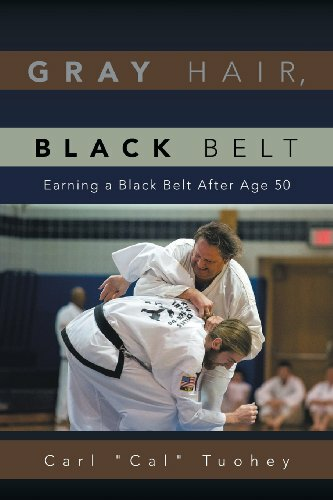 While geared toward those over the age of 50, this book will help anyone that has thought about taking a martial arts class and provides hilarious details on what to expect. The book is divided into two parts. Part I describes the inner workings of a Tae Kwon Do class as seen through the author's comedic eyes. Mr. Tuohey begins by explaining his decision to start Tae Kwon Do at such a late stage in life. It ends with Mr. Tuohey taking you through his Black Belt testing and earning his Black Belt. The book covers topics such as "The Class Format", "Sparring" and "Belt Ranks". It also provides descriptions for the various Korean terms used in class, and the patterns necessary to reach each belt level. 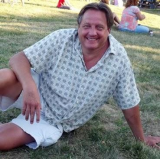 While taking the classes, Mr. Tuohey contributed articles to the school's monthly newsletter. Part II of his book is a compilation of those light hearted fun-to-read articles. They reflect an exaggerated viewpoint of what Mr. Tuohey saw and experienced during his classes, told as only Mr. Tuohey can.